Archaeologists working in the Southeast recognize differences in spear point forms and frequencies during the Paleo-Indian. By studying frequencies and distribution of the various types, questions regarding settlement and subsistence have been addressed. Paleo-Indian in the Southeast is divided into Early, Middle, and Late subperiods. 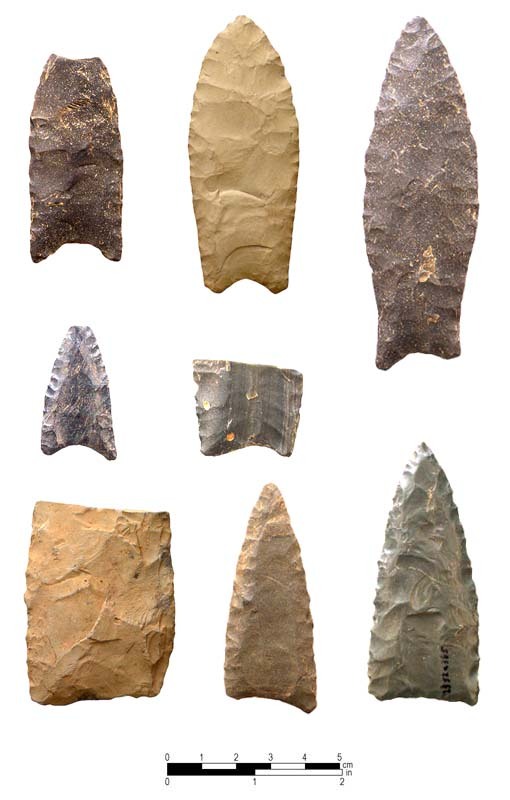 Early and Middle Paleo-Indian spear points and point preform (bottom left) from North Carolina. The bottom right specimen was reworked into a knife. Projectile points of the Early Paleo-Indian period (9500 - 9000 B.C.) are large, fluted lanceolates, very similar to the classic Clovis points of the West. What we know about the earliest inhabitants of North Carolina is based almost entirely on surface fins of these spear points. Concentrations of Early Paleo-Indian points have been noted in the Tennessee, Cumberland, and Ohio River valleys, as well as western South Carolina, southern Virginia, and the northern Piedmont of North Carolina. In the Middle Paleo-Indian period (9000 - 8500 B.C.) the number of spear points increases considerably and regional variability in spear point forms emerge. The Cumberland, Suwanee, and Simpson point types are thought to be typical of this subperiod. One thing all have in common is a narrowing or "waisting" at the base. The Late Paleo-Indian period (8500 - 7900 B.C.) shows increased population growth. Dalton points are the diagnostic Late Paleo-Indian point type. By the end of the Paleo-Indian Holocene climatic conditions prevailed and the basic hunting and gathering lifeway that persisted for the next 5000 years was set.